The Karimunjawa – the 27 islands that make up the island group — are located about 90 kilometers north of Jepara, off the Central Java coast, and about three hours by direct fast boat from the provincial capital Semarang or from Jepara. Until now something of a backwater, improving transportation connections are slowly making the islands, which were declared a national marine park in 1999, more accessible to visitors. The result is that more people are coming from farther afield to visit this island paradise. Home to some 9,000 residents who live on five of the islands — the remaining 22 islands being uninhabited, the population is largely Javanese, with pockets of Bugis and Madurese too. Arriving by kapal barang (the cargo boat) in the principle town, also called Karimunjawa, I found something incongruous about the strong Javanese feel to the place at first. Then I realized the difference was just that in all my island travels in Indonesia, I had never come across a Javanese island before: Karimunjawa is after all the only Javanese collection of islands in Indonesia — they are the only islands off Java where bahasa Jawa is the lingua franca, and where Javanese culture dominates, even down to the song birds in cages hanging outside many of the modest dwellings. Notwithstanding some of its white coconut-fringed sandy beaches, undoubtedly Karimunjawa’s main attraction is its wealth of marine life, including its pristine coral reefs, unusually rich marine biodiversity, and its rare and graceful white-bellied sea eagles. Although guide books speak of a “zoning system” with Zone 4 being totally off-limits to visitors, in practise this seems to have proved impossible to enforce. As a result, I had no problem visiting a small uninhabited island called Pulau Burung with a nesting pair of sea eagles and an almost fully adult offspring. My boatman even asked me if I wanted to land on the island, but this would have only disturbed the eagles and made them harder to observe. Still, it was an incredible sight to come across this family group of three majestic birds perched on a dead tree beside the shore, the younger one apparently eating his fish breakfast, probably caught for him earlier by his parents. Although the eagles seem to enjoy remaining quietly perched while surveying all around, when they do take to the skies, they display their true majesty. Gliding effortlessly above the water, they demonstrate their full two-meter wingspan and characteristic white undersides. Having previously visited the rather sad spectacle of captured or injured sea eagles undergoing rehabilitation on Pulau Kodok in the Pulau Seribu islands north of Jakarta, it made me wonder how many of those eagles taken away from their natural environment could be re-introduced into a safer setting such as Karimunjawa, where they might once again flourish in freedom. 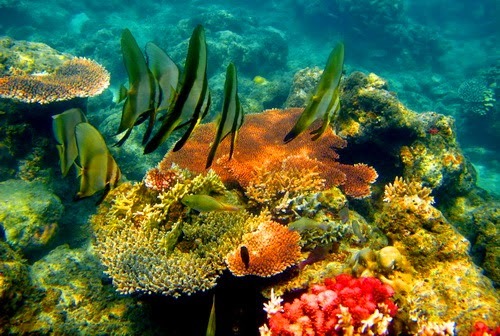 One of its other special attractions, Karimunjawa’s coral reefs are still in pristine condition and comprise 90 different species of coral, inhabited by 242 species of reef fish. They include several varieties of clownfish, one of my favourite reef fish, which live among the normally fatal tentacles of a type of sea anemone. With its absence of strong currents and its rich biodiversity, Karimunjawa offers excellent snorkelling, with local boats ready to take small groups or individuals out for half or full days at Rp 250,000 (US$28) and Rp 350,000 respectively. 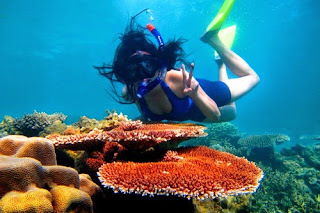 Most of the coral islands are within two hours by small boat from Karimunjawa Island, which is central to the island group. For more serious divers — and those with deeper pockets — while it is possible to organise diving trips from small operators on Karimunjawa Island complete with equipment hire, the best option is probably to use the Kura Kura Resort on Pulau Menyawakan, which is a five-star PADI diving resort with its own private island, 800-meter sandy beach, hotel and facilities. In fact, Pulau Menyawakan is the only island that seems to be truly off-limits to visitors to Karimunjawa, or at least those who are not booked into the resort, even during off season. During the season when the resort is open, from May 1 to Oct. 31, Kura Kura Resort operates daily flights from Semarang on a small Cessna aircraft to the otherwise very quiet airstrip about 20 km out of Karimunjawa’s main town. One of Karimunjawa’s other special features is its wealth of mangrove forests, which cover 300 hectares of the national park. Whereas much of the mangrove forest on Java has been destroyed by development, the authorities on Karimunjawa are now beginning to actively conserve the mangroves and make them accessible to visitors. For example, there is a “Mangrove Forest Walking Track” close to the small bridge that connects Karimunjawa Island to its neighbor Kemujan Island to the north. Resources gleaned from Karimunjawa’s status as a national park have been used to build a wooden walkway that allows you to walk from the road through the mangrove forest and out to the edge of the open sea, a total circular walk of about half an hour. One of the drawbacks of Karimunjawa is the lack of public transportation — there isn’t any! This leaves two options: negotiating trips around the main islands (Karimunjawa and Kemujan) with one of the handful of small private mini-vans, or alternatively renting a small motorbike in Karimunjawa town at a cost of about Rp 75,000 per day. Another drawback is that electricity is supplied to the main part of Karimunjawa Island for only 12 hours a day, from 6 p.m. until 6 a.m., with very few places running generators during the day. Other parts of the island receive even less power, at only six hours a day. 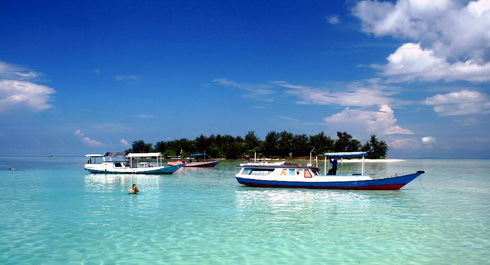 Karimunjawa is also certainly no food-lover’s paradise. Ibu Esther on the alun-alun field has a reasonable self-service warung food stall, but there is hope — a new waterside restaurant called Amore, in a beautiful Javanese-style house, is starting to push the culinary boundaries a little, and also serves refreshingly cold Bintang beer — and all day too! They also have an intermittent wireless internet connection. While things are gradually starting to change — with the exception of Kura Kura Resort, which is in a class (and location) of its own. Homestay karimunjawa priced at between Rp 190,000 and Rp 250,000 a night with air conditioner, So, don’t delay as long as I did — birdwatchers, sun-worshippers, snorkelers and divers, pack your bags and head to the Karimunjawa islands, and escape from the pressures of mass tourism. Or, just bring a heap of books that you’ve been meaning to catch up on. Either way, you won’t be disappointed. On Monday, Wednesday and Saturday a ferry — the Murni — leaves from Jepara at 9 a.m., and returns from Karimunjawa at 8 a.m. on Tuesday, Thursday and Sunday. The trip usually takes seven hours. It’s worth checking the timetable on the internet because it can change at the last minute. And beware: the ferry stops running for a month of maintenance in November, which meant that I ended up having to snuggle up on a local kapal barang (the cargo boat). The fast boat, called the Kartini, leaves from Semarang port on Monday at 9 a.m. and Saturday at 10 a.m., and returns from Karimunjawa at 11 a.m. on Tuesday and 1 p.m. on Sunday. Booking tickets directly with the Dinas office of the Transportation Ministry office is problematic (0291 591048), unless you use an agent. The direct trip takes about three hours, while fast boat trips via Jepara (the Monday/Tuesday trip) take a total of four hours. The three main small hotels are: Hotel Escape, Blue Laguna Inn and the Karimunjawa Inn and charge between Rp 180,000 and Rp 250,000. The Nirvana Hotel is more expensive, the suite costs Rp 1.7 million a night. There are numerous cheaper home stays both in Karimunjawa town and also in some of the villages on the two main islands, Karimunjawa and Kemujan. These range from very good, some with AC, to rough and ready, without as much as a fan. Boats for day trips and motorbikes are easy to arrange through hotels and home stays as is the renting of snorkelling gear and diving equipment. The best time to come is from April to October. The weather is more unpredictable from November, and can be stormy and very wet in January and February.